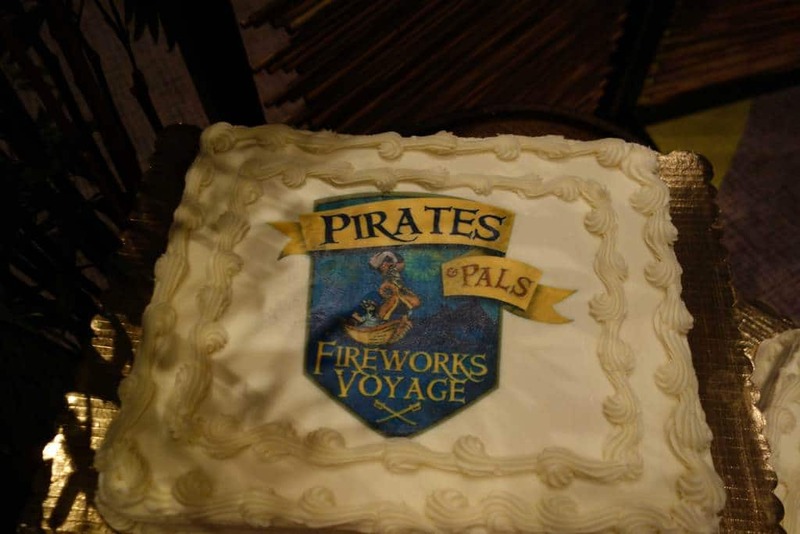 Pirates and Pals Fireworks Voyage is one of the few character based experiences in which my family and I had never taken part. I was curious to learn about the actual experience and I was travelling alone, so it wouldn’t cost me as much as sailing with the family. However, sailing alone with a giant pointing hand on your shirt makes parents think you may be stalking or something. 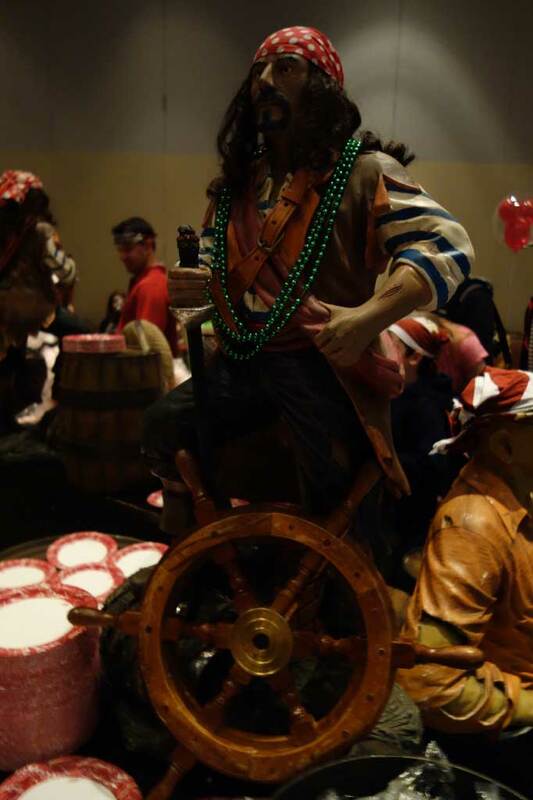 The night I sailed, we were asked to meet in the Convention Center attached to the Contemporary Resort. I just stopped by the front desk and asked where the meeting location would be. When you find your destination you’ll see this sign. 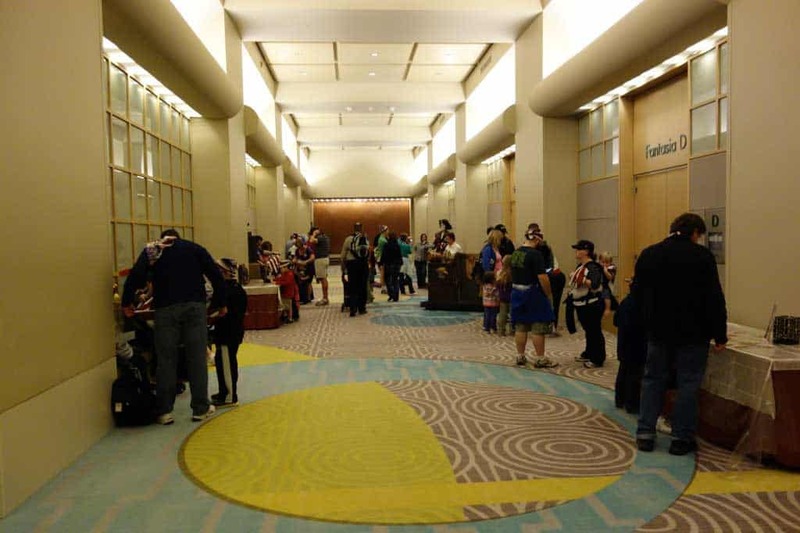 I made my way down this hallway to the check in location. As I arrived at the check-in desk, I found that there was a security guard there. Had he been told that an avid character hunter was going to be on board? After checking in at the desk, you are instructed that you must wear this bandana on your arm, head, leg or around your neck. I was thankful and relieved that I wasn’t asked to wear a banana on my head. Any good pirate wears a bandana we were told. These landlubbers must be friends with some pirates? In addition to the attractive and large sized bandana, you’re given this highly collectible card that I may list on Ebay later today for $139.99 but accept the highest bid. Don’t be a hater…a pirate has to find a way to pay for all this quality first hand reporting. I was given the Row 8s. The lady didn’t have a clue what the s was for. I said “single,” she replied, “I’ve never seen that!” Yes! Another first. I’m the first solo pirate she had met on the cruise. I was assigned to the SMEE boat. 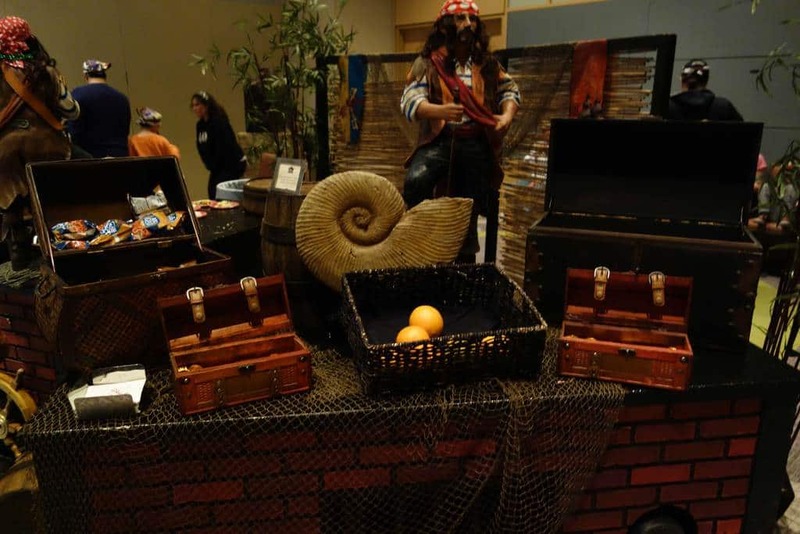 The hallway had a few nice pirate themed statues and props to add to the pirate feel. This guy below really needs to eat some more of the goodies that they offer inside. He’s looking very anorexic and a bit ashey. He needs a good tailor too! 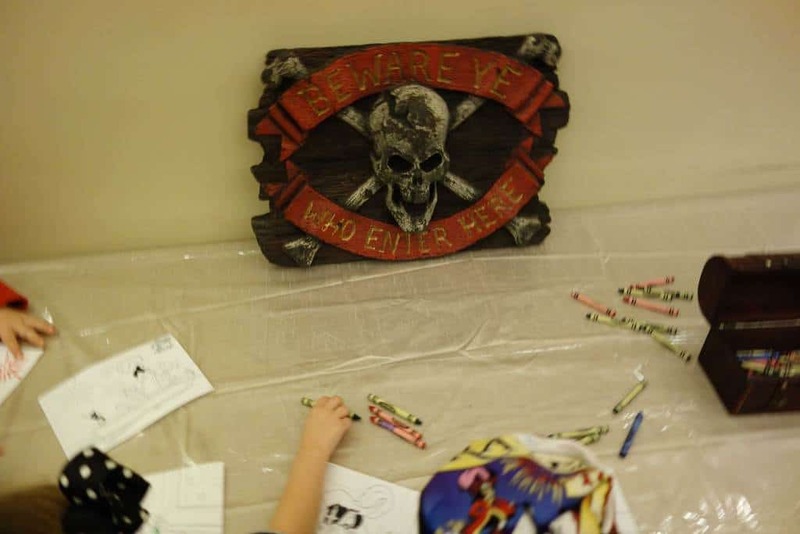 When the cop wasn’t looking, a certain pirate took some treasure. Okay, it was just the gold foil chocolate coins that everyone left behind. There were a couple of little tables with activities available for the kiddies, um junior pirates in training. 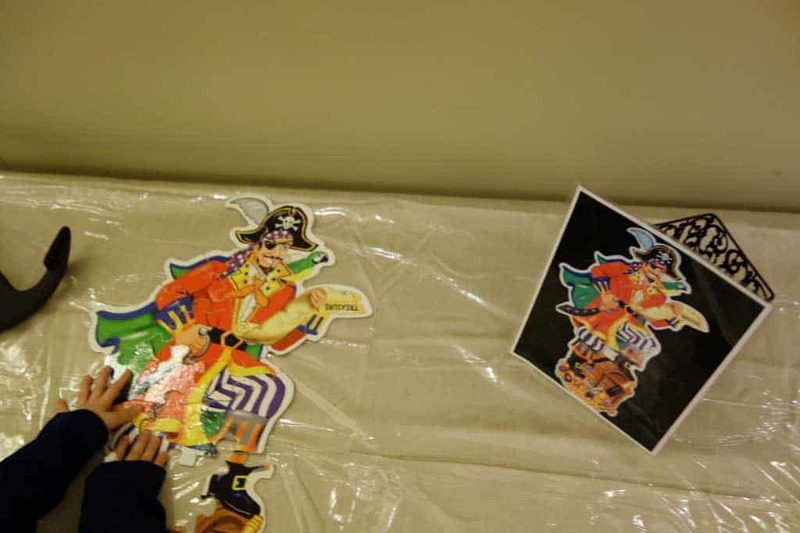 Nothing teaches a young one to pirate like crayons and 20 piece puzzles. I took a piece and pocketed it for a few minutes and waited until the kids needed one more piece and swooped in as the conquering hero. But I gave it to the Dad nearby so he won’t think I was stalking again. 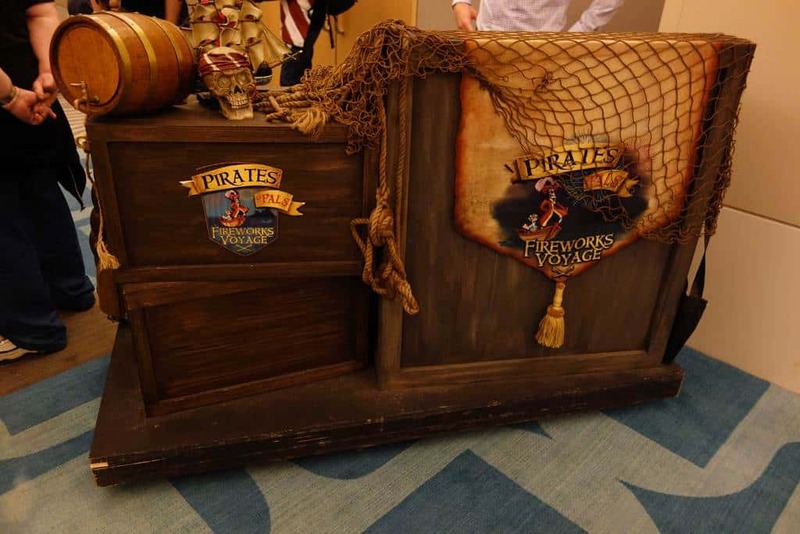 After a few minutes of pirates arts and crafts, the hosts for the evening arrived. Their name is Patch. Well, the guy on the left is Patch and the guy on the right is actually named Patch. Patch is a great comic, but Patch is a great singer. Patch has a quick wit and Patch has a high pirate knowledge. Just remember, their name is Patch. 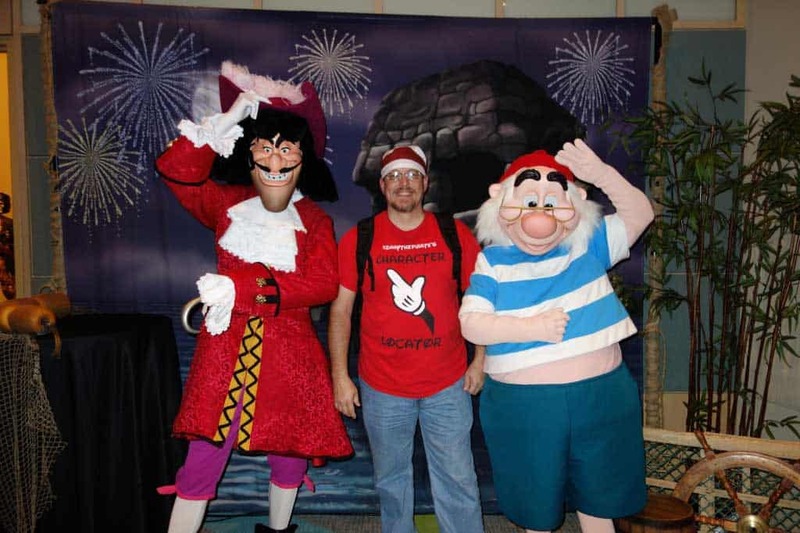 The Mr. Smee boat was led by Patch. He’s the guy on the left. Please don’t confuse him with Patch on the right. As you enter the room you find a variety of drinks and snacks that include: water, lemonade, tea and coffee. 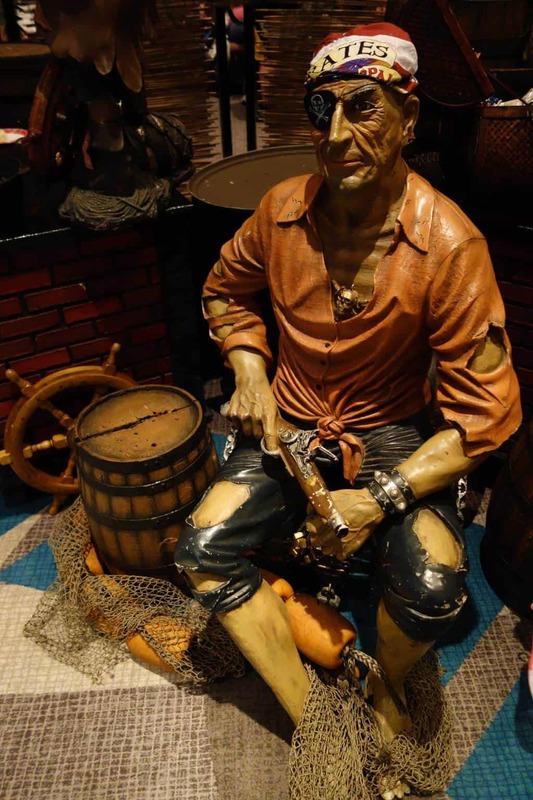 There’s no rum allowed on board this vessel as Captain Sparrow has already confiscated it for his personal consumption. In the back of the room were a couple of tables. The one on the left had two cakes that were devoured faster than a Labrador eats her dog food. Patch had promised that he would help get the kids full of sugar and junk food before asking them to be seated on the boat next to their parents. Patch didn’t think it was a good idea though. Looks like someone at Disney must read this blog. There’s an exact model of me! There’s even an exact likeness of my older brother. 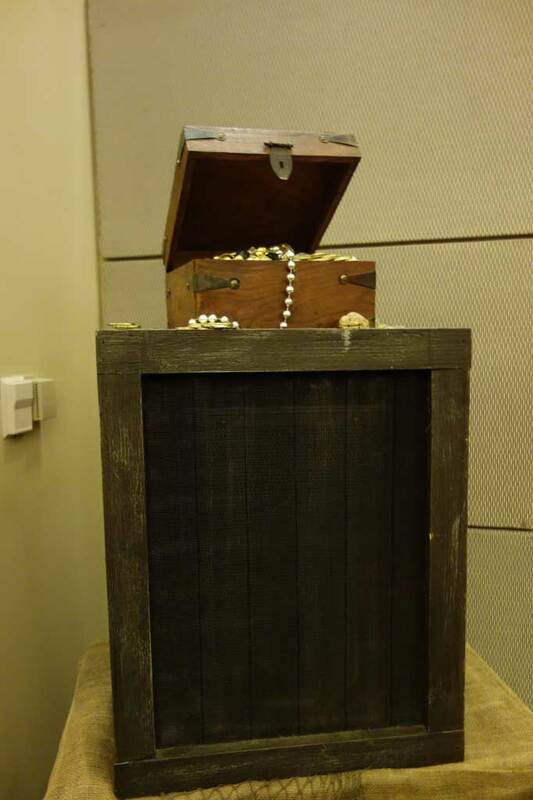 The treasure chests were filled with pretzels and cheese popcorn, there was fruit and a bunch of those chocolate dubloons. There were a bunch of bags of cotton candy, but all the little snickerdoodles took them, PIRATES! The dubloons were there until I stopped by at the end :) I grabbed a couple bags of popcorn and some pretzels to take on the boat. You may take food and drink on the boat as long as the drink has a top or lid. 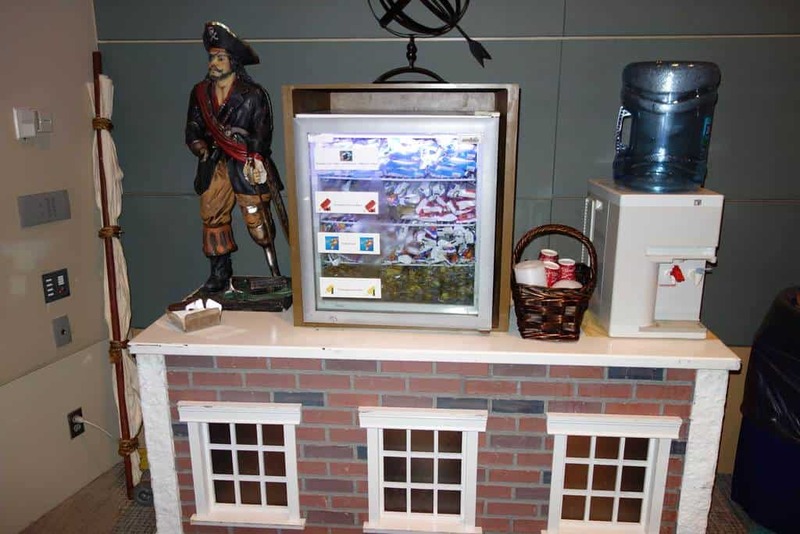 You just paid $170 for a your family of four, don’t be shy about taking snacks on the ship. As if the cake, popcorn, pretzels, chocolate and sugar drinks weren’t enough, there’s a freezer in the front of the room full of ICE CREAM! Those little munchkins ate all that cake AND all the Mickey Premium Bars. 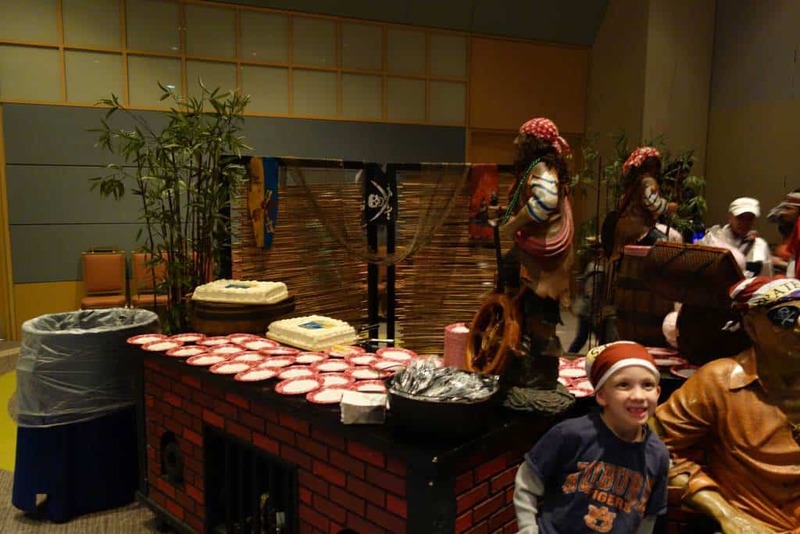 While the kids are filling themselves with sugary treats, Captain Hook and Smee appear to take photos with the guests. 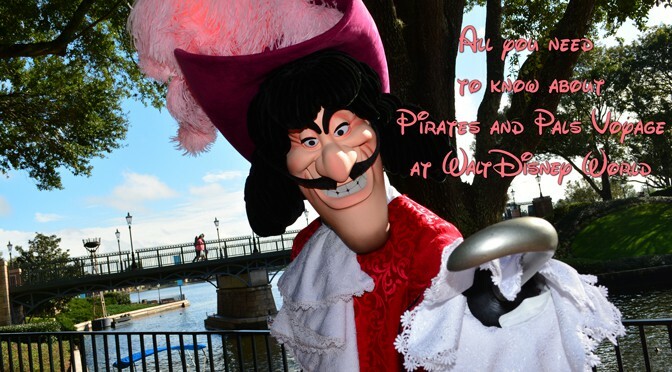 I, of course, was first in line :) Captain Hook really liked my shirt and wanted the hand pointing toward him. After a brief scuffle with Smee, the good Captain won. Lots of guests dressed the part as pirates for the evening. There was even one female Peter Pan along for the cruise. What’s a good pirate cruise without a game of Limbo? It’s actually a stretching exercise designed to limber you up so you can paddle better later on. After a short time of consuming goodies, taking pictures with Hook and Smee and doing the limbo, Patch returns with Patch. They ask us to segregate ourselves according to the highly collectible card (Ebay listing later) that we were given earlier. The Hooks are on the right and the Smees are on the left. The Smees had the better crew and Patch was hilarious. 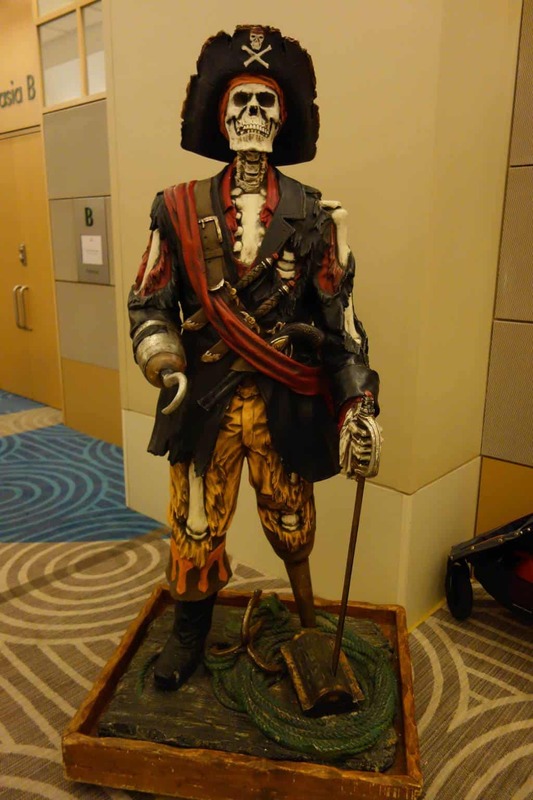 Patch didn’t sing much on our cruise, but Patch didn’t tell many jokes on the other vessel. Patch chooses a pre-determined first mate and hands him or her the appropriate flag. Patch stopped for a quick photo of the kiddies and their flag. He made a funny wise crack about me taking pictures of the kids. He thinks I’m stalking too??? These parents didn’t mind me using the shot here but all rights are reserved for whoever they are from Arizona or Connecticut or something. blah, blah, blah. Either way it’s a cool flag and perhaps your little one will be chosen. 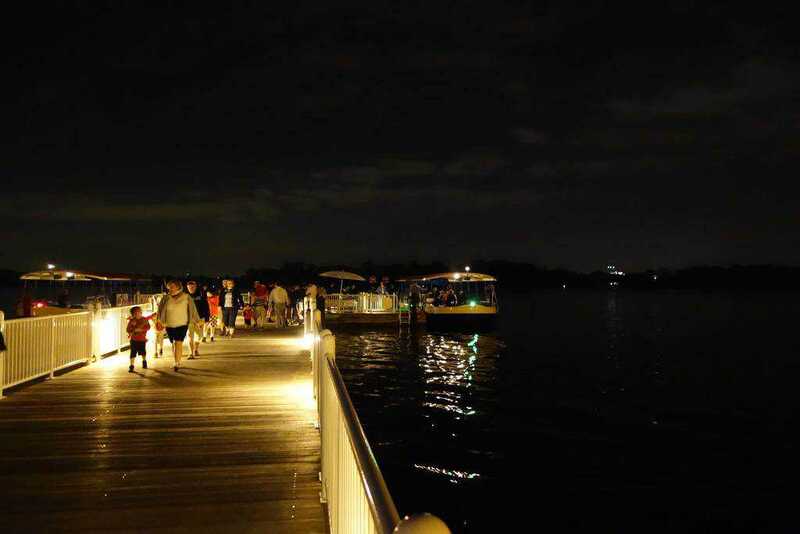 We made out way from the Convention Center out to the boat docks located near the pool area. We boarded these pontoon boats that reminded me of the ones from the old Jaws attraction at Universal. Did they get these for a discount? Will there be sharks and loud guns? Patch assured us that the Fireworks scare them away and they prefer people staying at Fort Wilderness who don’t read the NO SWIMMING signs. Patch greets all the guests and asks where they are from and cracks jokes about each family. He then asks what you’re celebrating. It wouldn’t be very Disney not to. I think every child on the boat was having a birthday that night. Neither Captain Hook nor Mr Smee actually ride the ship with you, they merely appeared before for a photo op. Celebrities! 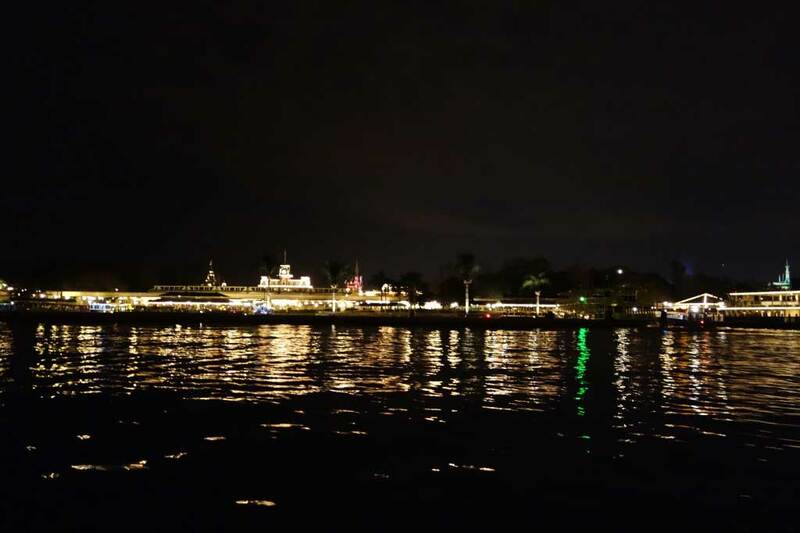 You’ll get a great view of the Magic Kingdom on the boat. You’re parked right in front of the place. It’s the only parking area where you know where your vehicle is at. 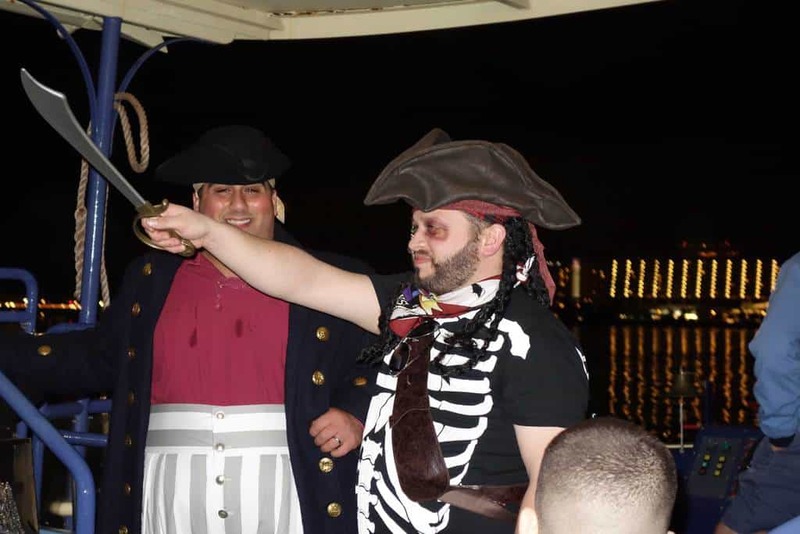 Patch saw this Black-eyed Jack Sparrow wannabe on board and proceeded to bring him forward for about 10 minutes of embarrass the guest that paid $50 to see fireworks. We followed up this time with some Disney Trivia. Patch didn’t like it that I was going to take toys from the kiddies. After winning an inflatable sword, I gave it to the parents in front of me to give to their young son. Don’t tell Patch that I snuck a few answers to other kids. Don’t worry though, Patch gives every child a toy upon disembarking. INSIDER TIP: Ask for an ODD numbered row on one of the vessels. They are the ones that actually face the water. Either way, you won’t get good fireworks photos. This is about the best that I could do. It looks like a pirate who was doing acid or something. 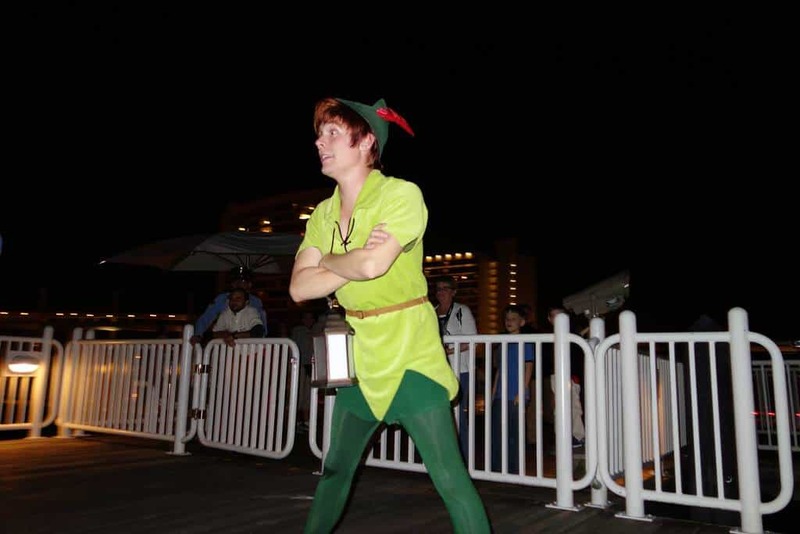 After viewing the fireworks we are taken back to the Contemporary Resort to meet a special guest. I intentionally went to the back of the line for the meet and greet to see how long it would take. It took me 29 minutes. When it was my turn I crowed like the lost boys and Peter crowed back, but said my crow was a little weak. I belted out a better crow and joined him for a photo. The Cast Member said she has been working there for quite some time and hadn’t heard Peter crow in years. Leave to me to be the one, huh? The only thing that disappointed me in the experience is that the photo below is the only one the Cast Member took with my camera. 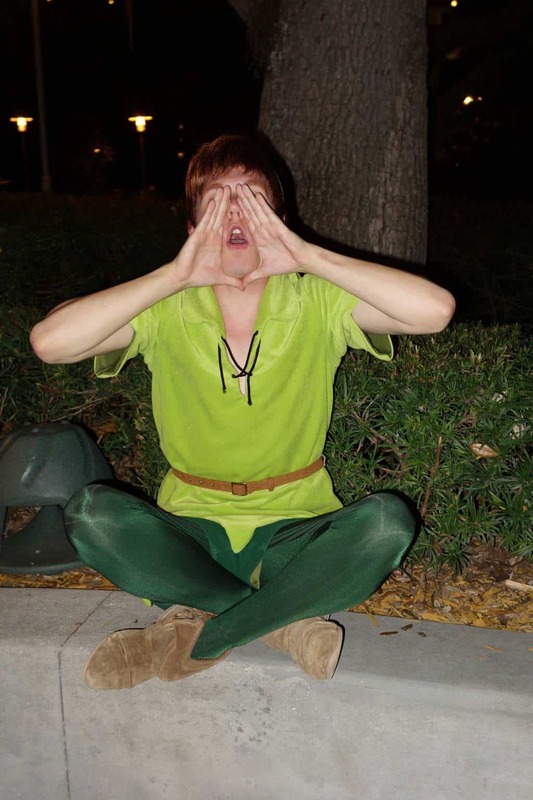 I would have to pay $15 to get a decent photo of me and Pan. No need, I’ve met him a dozen times. It was a fun experience and Patch was an excellent host. Not sure how Patch did, but Patch was great. 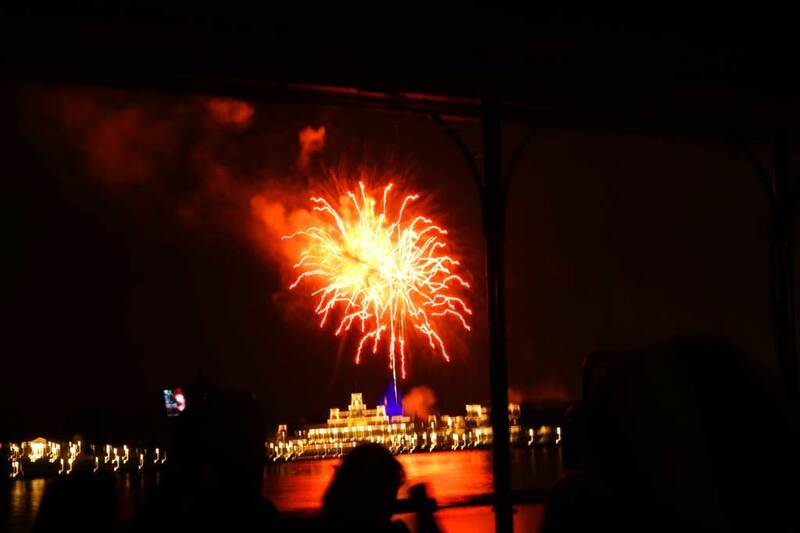 Food, character meets, comedy and fireworks. It’s worth the price to experience with your young children. When should I arrive: at least 1.5 hours before Wishes begins that evening. Reservations: Can be made up to 180 days in advance. 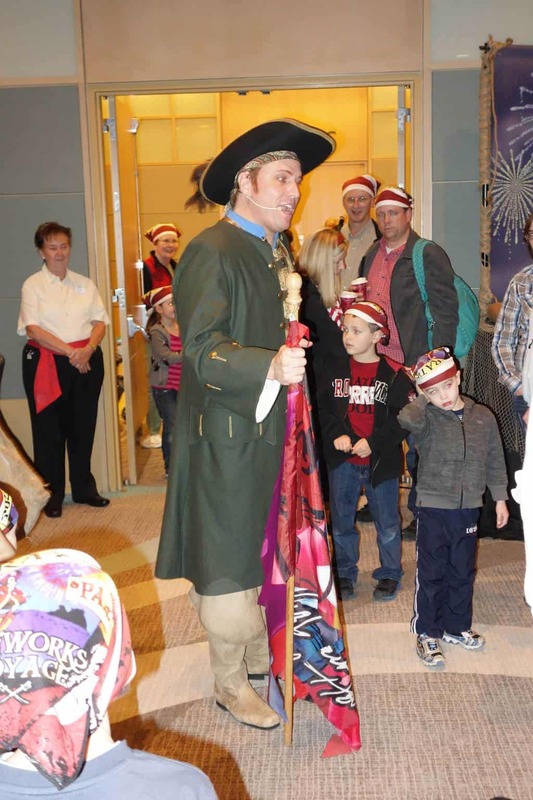 Call 407-WDW-PLAY or visit this link. Requirements: Credit card charged when making the reservation. 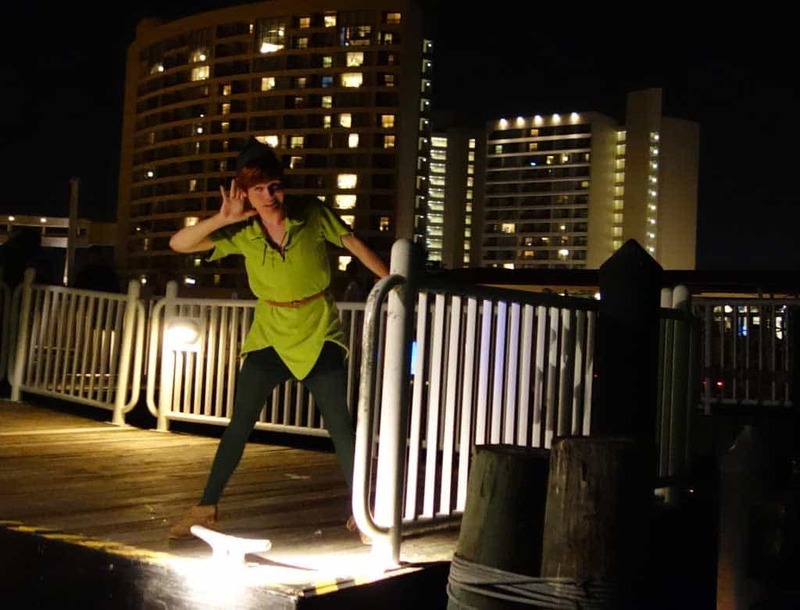 What time does it end: The cruise will return immediately following wishes and you’ll be given time to meet with Peter Pan at the dock or inside the Contemporary depending upon weather. Cruises may be cancelled due to inclement weather but cruises DO sail in rain and cold. Same-day bookings are allowed, if available, up to one hour prior to the experience. Guests under 16 years of age must be accompanied by a paying adult (18 years of age or older). Each boat accommodates up to 60 Guests. If your party has 13 or more people, please be aware that you may be separated into 2 boats. Character appearances are subject to change without notice. How long does this event last from check-in to departure? I’d like to do it, but will have the kids up early the next morning! I know this post is old but I read it and booked the cruise because of it. We had a great time and I didn’t ask but we got an odd number row so we had a great view. I wanted to add that I told my 4 year old to crow when she was talking to Peter. He told me that he no longer crows because one time an angry dad yelled bad words at him out the window of the Contemporary because the crowing woke up his baby. So you are lucky you got the crowing in when you did! 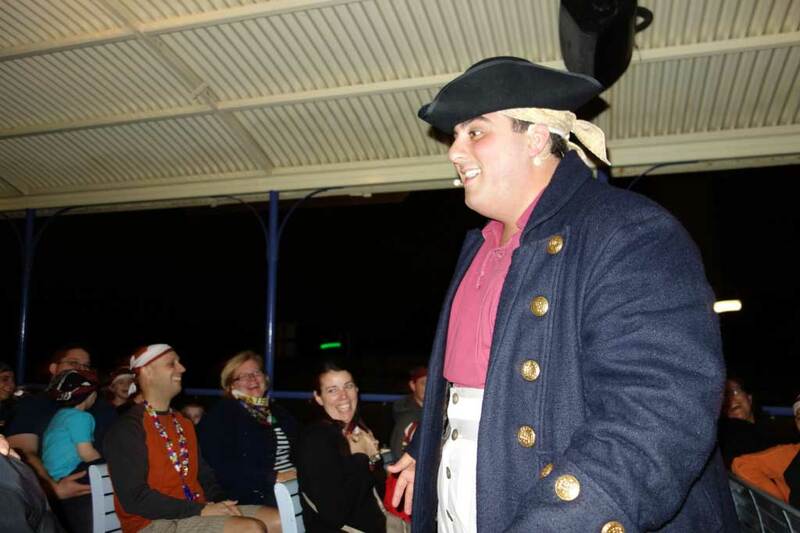 We *love* the Pirates N Pals Cruise, and try to fit it in to every trip – even though we are all adults now! Arrive early – when we were there in January of 2016, there’s now a new “scavenger hunt” that you can do that takes you all over the main floors of the Contemporary Resort in search of answers. Lots of fun, and helps keep the little nuggets busy until it’s time to meet Patch & Patch! One really great thing to note is that on colder nights, they will have lots of fluffy white blankets on board. Pro tip: spread one out to sit on (make sure it’s folded to be a couple of layers thick) and then wrap another one around each family member. You’ll be snuggly-bug warm, and the cold breeze off the lake will bounce right off that blanket! 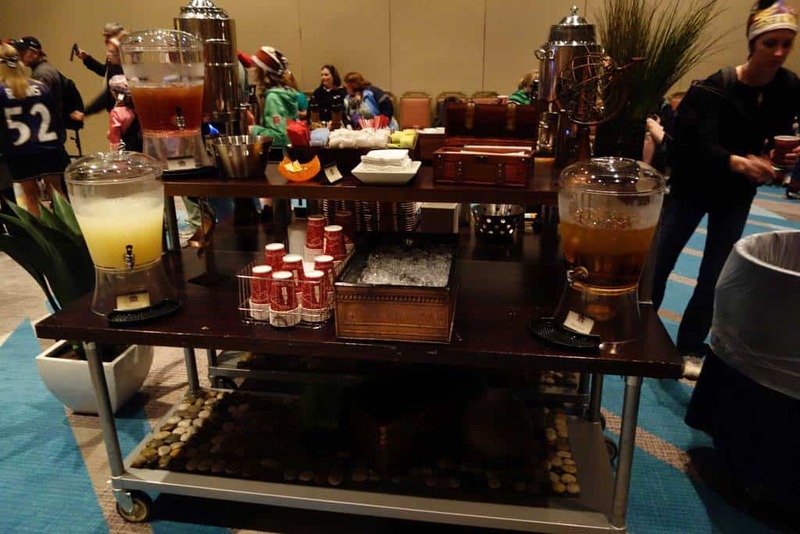 Last but not least, this experience is really “wheels friendly” for folks who have to use an ECV while at WDW. 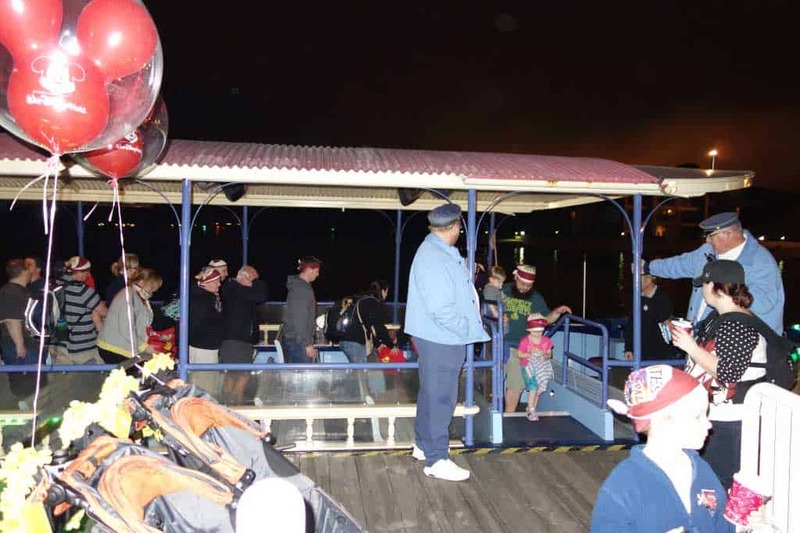 You will be taken down to the boat just a bit early by a CM, and can park your ECV on the back end of the boat, and then it’s just a couple of steps down to the benches on the boat – or you can stay seated on your ECV. I can’t recommend this experience enough – it’s a true “hidden gem” at WDW that everyone should budget the time, and the $ for!!! Hi Kenny! With my luck, we’ll get even # seats lol. 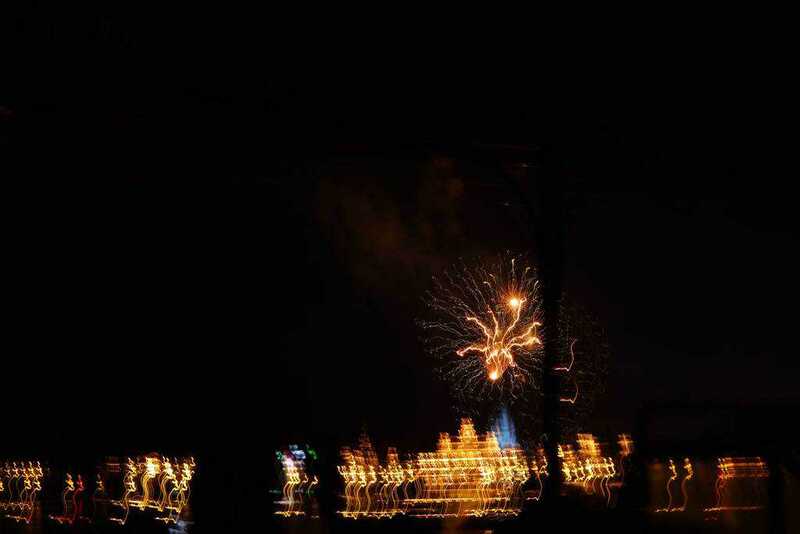 Is the view of fireworks decent from that side? I thought the top of the boat might obstruct the view. Thanks! Thanks for the review. We attended last week, and everything was still as you described. FYI, we were a party of 2. We also had an “S” on our ticket. The CM said it meant “share.” Because each side only comfortably holds 3-4 people, someone might want to share our bench because we had only 2.
we are thinking of doing this but my grandchildren hate the noise from fireworks. Think we should bring noise cancelling headphones? You’re farther away from the firework blast, but some earplugs or headphones couldn’t hurt in case they child wants them. Hi Kenny, do you know if they offer any type of discount on tickets for this if you have an annual pass and/or DVC membership? No discounts for this offering. I know this is OLD, but I saw there is now a 10% off discount. It may be temporary, but worth checking before you book. 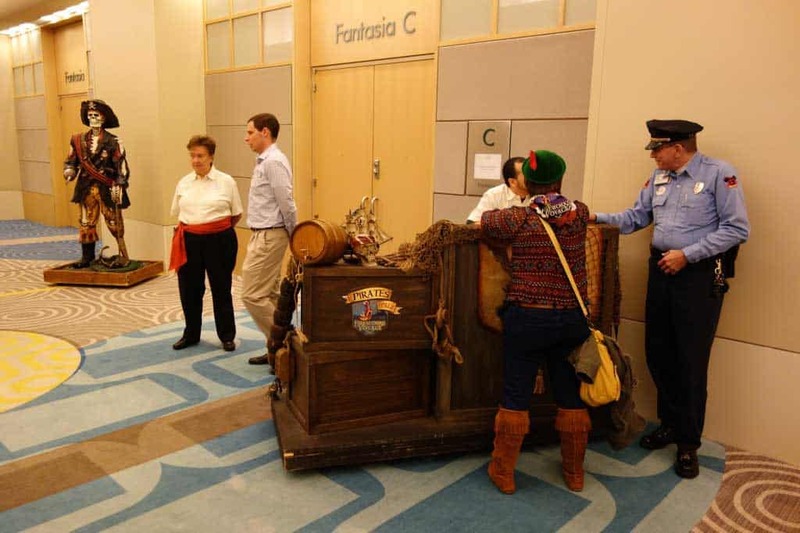 Do Hook or Smee sign autographs here? Does this cruise run every night of the week? Or specific MK firework nights? Kenny, what time does this happen? How long does it last? Is it usually crowded? How much does it cost for 2 adults and 1 child? Thanks! Lasts a couple hours. Schedule and current cost be acquired by Disney with a phone call. Kenny, I am traveling to WDW the week of July 17, 2016. I have tried to schedule both the Wishes Dessert Party and now this boat ride. The entire week is blacked out for anything fireworks related at MK. Also fireworks and a nighttime parade are not listed as options on the calendar. Has MK ever cancelled an entire weeks worth of fireworks before? I am surprised this would happen during one of the busiest times-if so, this is disappointing. Thank you in advance for any insight you may have. Fireworks will not be canceled. May not have been listed yet, but they will happen. 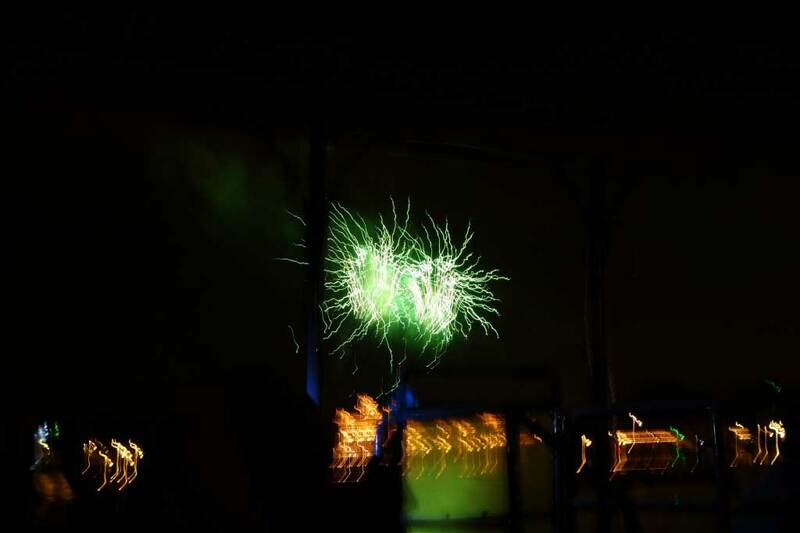 Was the music for the firework show played on the boat? Notice the November 12, 2015 event starts at 6:00. Any idea what the schedule would be and when we have to be there by? Is that when the cruise leaves? Seems kind of early for the MVMCP fireworks and electrical pageant. Just subscribed to the Character Locator – thank you!! We are signed up for the cruise on May 18th. If we are coming from the Magic Kingdom, what time should we plan on leaving to get to the Contemporary Resort in time? The CM on the phone told me to be at check-in by 8:45PM, but that seems late? Also, after it is all over, what is the best way to get back to the Animal Kingdom Lodge? We will be relying on Disney transportation or will happily pay out of pocket for a cab/Uber to get us back to the resort sooner. With two small kids in tow, they will need to be in their beds asap. What is our best option? From MK to Contemporary, just walk the path. From anywhere to AK is bus. Great review! Do you know if Peter Pan is always there at the end? 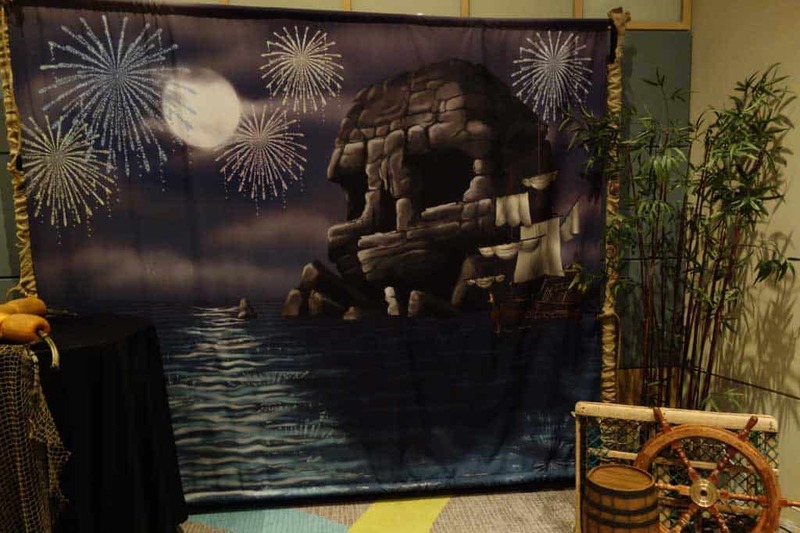 The WDW website is vague on this but is that just because it’s a “surprise”? 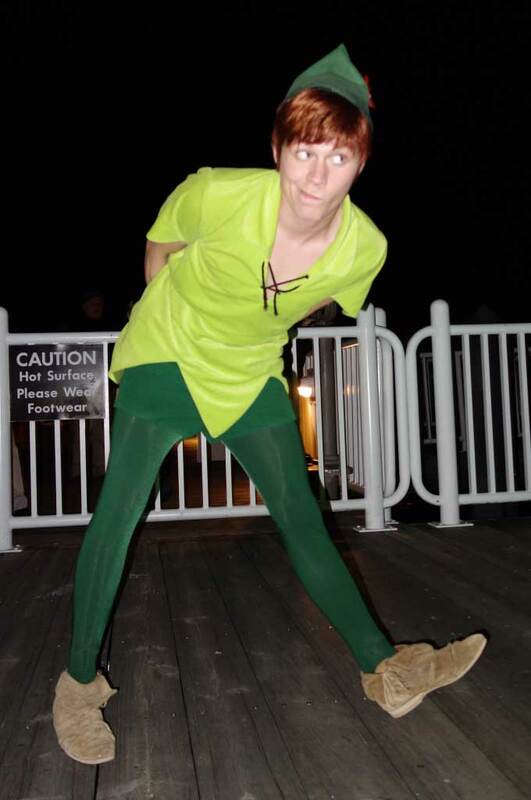 The whole reason we want to go is for my son to meet Peter Pan. Do you always get to see fireworks on the Pirates and Pals cruise? I noticed that the cruise goes on days in November when Wishes and the Electrical Water Pageant is NOT scheduled at the MK. Do you get to see some other type of fireworks on the cruise other than these then? Any chance the photos can get fixed again? I love this review and think my son will too (with the picture, of course). 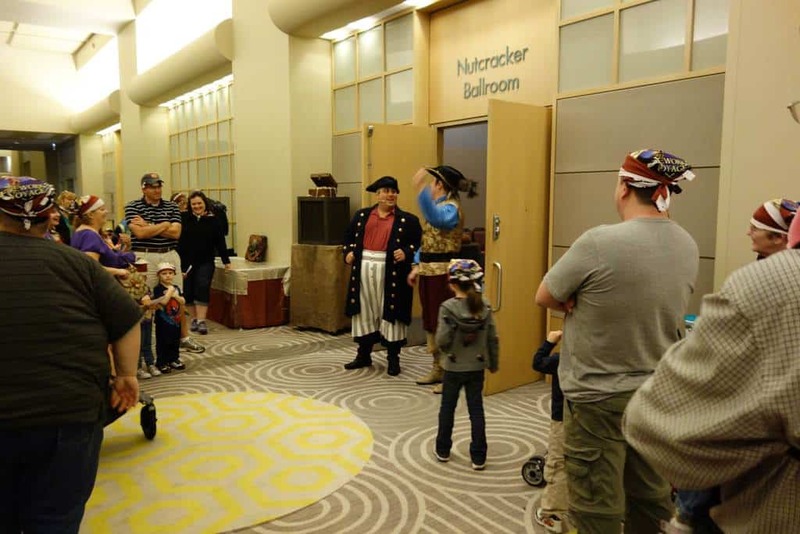 Do Captain Hook and Mr. Smee roam around the party room meeting guests, or do they stand in one location while everyone waits in line for their turn? Thanks for your help! I LOVE your site!!! Mind fixing the pics on this one Kenny? Thanks for the great info! I’ll be happy to fix those images for you this afternoon. It must have been part of the issues I ran into with relocating my site this week. Thanks for letting me know! They will enjoy it, but won’t understand the jokes on the boat. You suggested asking for an odd numbered row on the boat..is it too late to make that request when actually checking in or would the seat assignments already be done? If so how do I make such a request ahead if time? It’s something you could try ahead of time, but they are pre-assigned by the time you arrive. Kenny, is there anyway you can help me find 2 tix for this voyage? On October 8, 10, or 11? I just learned about this trip thru your page. When booking they told me an ECV could be brought on the boat. Do you know if that row is odd or even? Yes, children under 3 can attend and it would be fun for them too. Can adults dress up too? I know that usually one can’t except at MNSSHP. Yes, it’s prepaid, but you can get refund with advance cancellation. 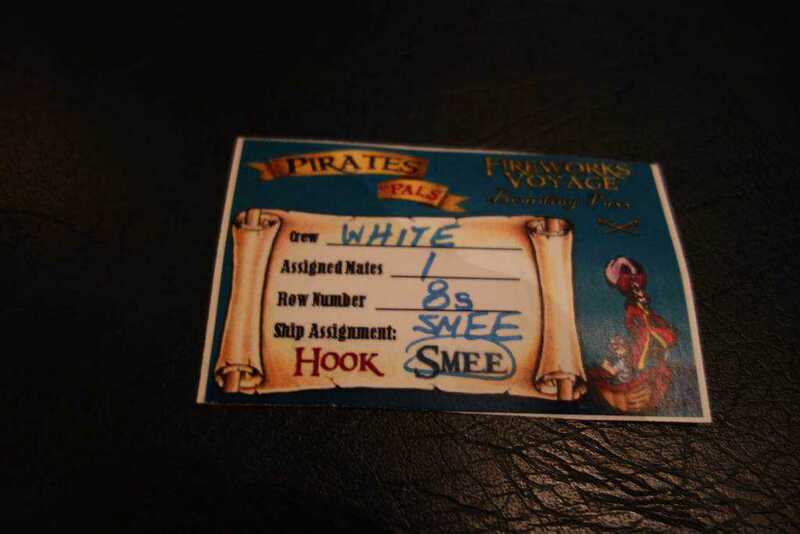 I gave Captain Hook a kiss at The Pirates and Pals Fireworks voyage! Kenny – Have you heard any recent news about the pirates and pals fireworks voyage? I am trying to book for early November, when I call they say that the Nov. dates are not available for booking yet. When I look on the website there are no times listed for any of the dates in Nov. We are well past the 180 day mark. I am getting a little worried! Just haven’t opened up those dates yet. do you need theme park admission to do this on top of the $59 pp charge? No, it departs from the Contemporary Resort, so no admission is required. You have this listed as a Character Meal (Dinner) but I was unable to find any information on what is served for dinner. 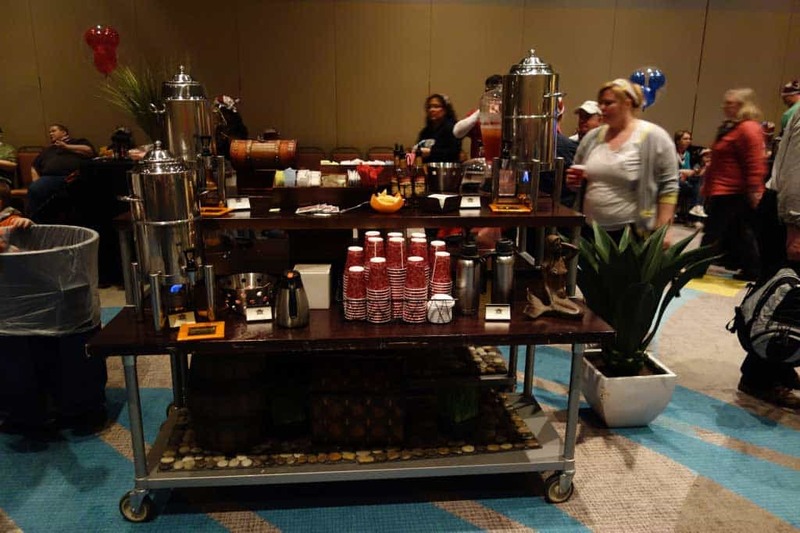 I did see the info regarding the beverages and sweet treats :) Getting ready to book our dining plan and I know my boys would love this! Just snacks, but hosted around dinner time. I changed the link above to reflect that. It’s explained in detail in the post. Just posted this on your FB page. But I got video of the complete show from the cruise, with a few of my own comments. Would you be interested in obtaining that video? Would Probably take a long time to download but I’d be happy to send it if you think you could use it for anything? If not, no problem either. Just thought I’d offer. Loved the review we are booked up for 4th July , do you think I could phone back up and ask for an odd numbered seat? People have been telling me that Disney isn’t allowing requested seats, but you could always ask! My family went on the voyage last Sunday, March 9. It was a lot of fun. 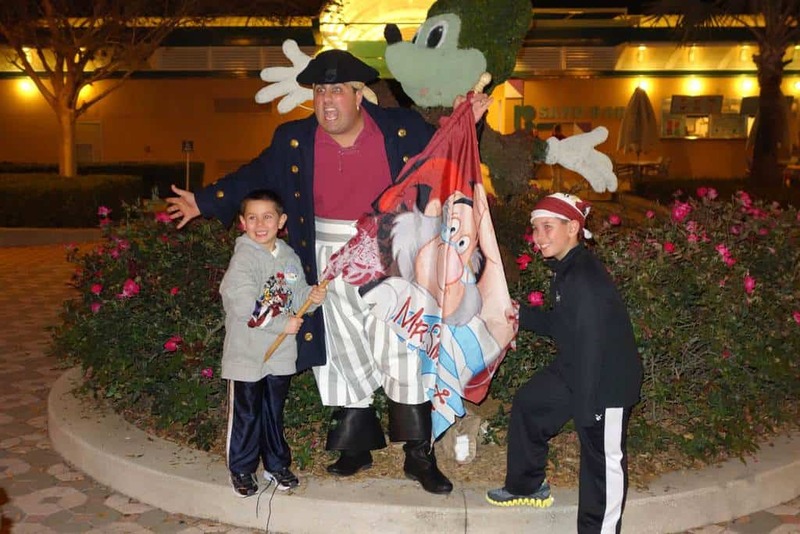 My 5 year old daughter was chosen to carry the flag for Mr. Smee’s boat. It was great. I lost my camera a few days later, so now I don’t have any of the priceless photos. I’m still hoping and praying it is found and turned in! Oh no, that would have been a great photo! Hoping it comes back. Great review. Thanks for all of the info! A couple of questions…1. How early can you book this? 2. What time did you get back to the Contemporary? I think they open it 60 days out and we returned to the Contemporary right after the fireworks show. After a bit of research I found that it can open as much as 180 days in advance. I called today to book for March. 17. I requested for an odd number but she said there wasn’t anywhere to make that request. Should I call back? Will odd number work on both boats or was the other boat facing a different direction? Also, do you request a row once you get there or when you make your reservation? They faced same direction. Request in advance. Searing is already assigned when you arrive. We loved this in Oct. I did ask for an odd number at booking but didn’t get it. Still was a good view though. I just booked for December 22nd. I like to have different views of Wishes and we haven’t done this before. We have teenage daughters but it is fun to have them do “little kid” stuff too. How do you rate the actual view of fireworks? Should I call and request an odd row seating? I would give it a try. All they can say is yes or no. It’s fun, you can see the full show except the stuff projected upon the castle. 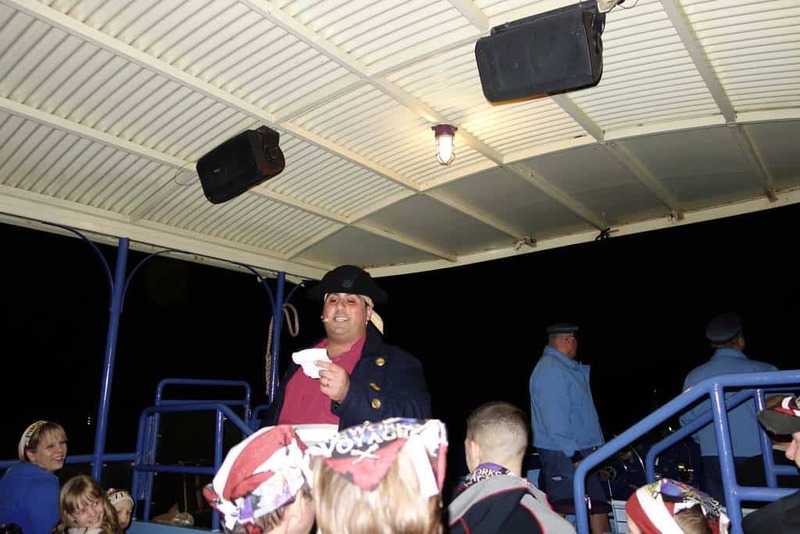 Kenny, I’m pretty sure your Patch was Capt Jack Sparrow’s assistant last time we saw him at MK! He was hilarious!! We just got back and LOVED the cruise, thank you for all your info. I did, however take your comment “either way you won’t get good fireworks photos” as a challenge and I got some great fireworks photos! I’d be happy to send you some. I set my ISO to 5600, aperature 5.6 and shutter speed to 1/60 – turned out great! And you were correct, the odd numbered seats were facing the fireworks. 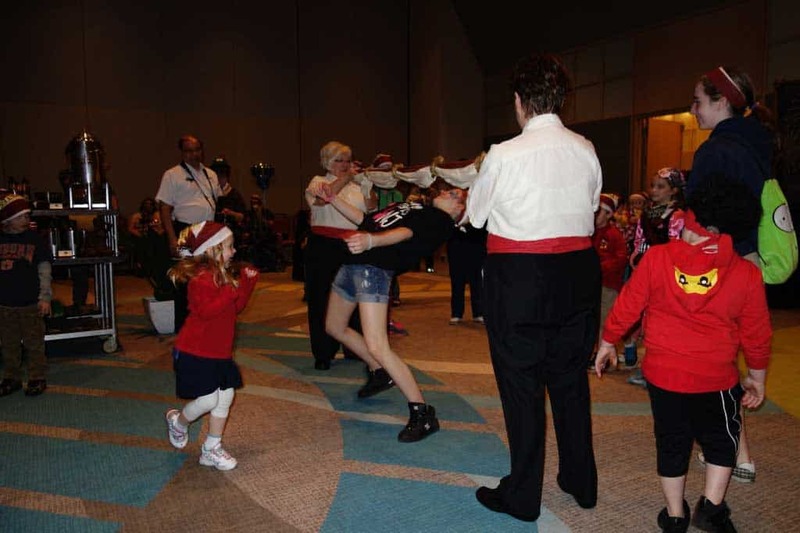 We did not have dancing or games like you did, but still a ton of fun! Thank you for this great review – I just booked today for September!! The fireworks start at 9 and our trip starts at 7:45. Maybe they’ve changed something? Let me know how your experience goes! Was told the same for Oct. 26. You said the activities started at 6:30pm? Was this for 9pm fireworks? Our trip sets sail at 8:45pm for water pageant and 10pm fireworks, but I would love to have DD5 interact with Mr. Smee and Capt. Hook, so I want to make sure we get there in plenty of time to do that. 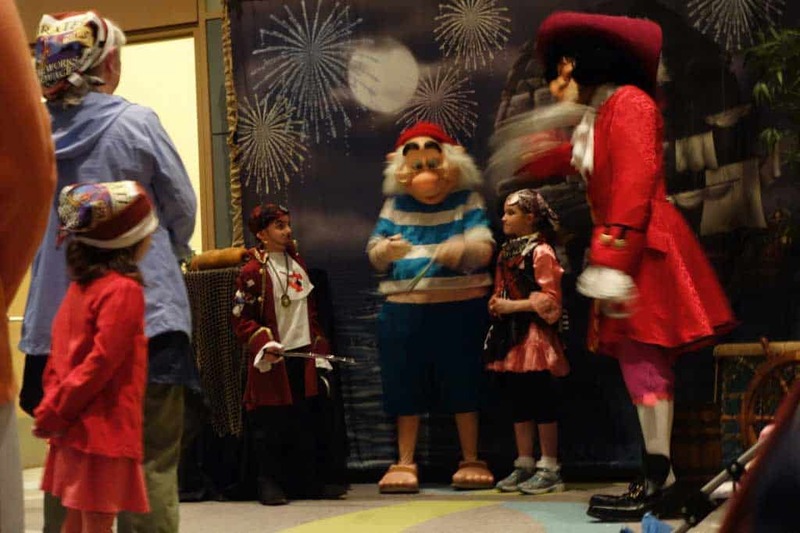 Is the PP photographer in the room with Smee and Hook or just at the end with Peter Pan? Thanks for the awesome write up on this… most informative I have found. THANKS! My Fireworks show was 9:00 PM. Yes the PP photographer is there for Hook and Smee as well as Pan . Thanks for the compliment! 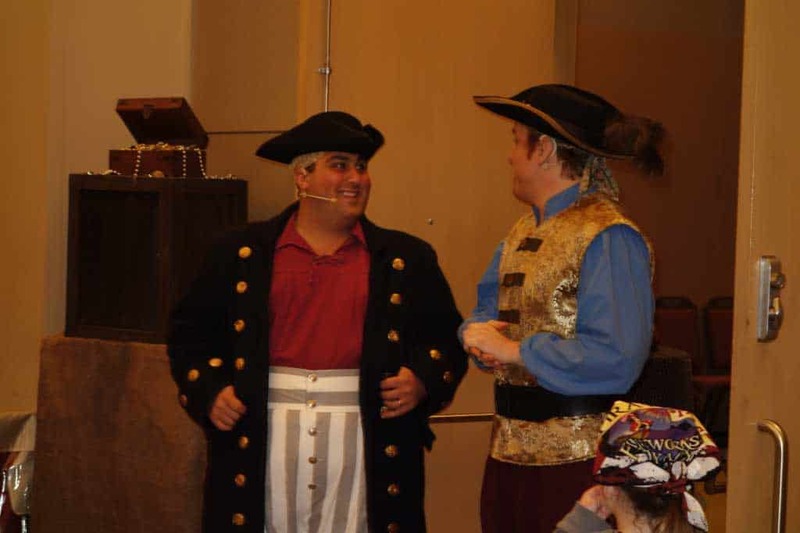 They will give you a check in time and you’ll have plenty of time with Hook and Smee. We did this in November last year. On our cruise, we had the other Patch that you didn’t have, and he was hysterical. Our cruise DID include the electrical water pageant. I guess it just depends on whether or not it’s held that night and the time it’s held. We too were last in line to meet Peter, and he spent a lot of personal time with my six-year old son, as a result. Went through his whole autograph book commenting on the previous signers and played a game of hiding the marker from my son. He was one of the best character experiences we had. It was well worth the money for the two of us to go. Do you have to be there at 6:30? Or can you tour MK then walk over to get on the boat? What time did you ‘set sail’? Just ask when you make the call. You’re welcome. It took me about 3 hours, but you’re only on the boat for about 30 minutes. What a great review!!! Very informative with the right amount of comedic relief! Be my friend, lol! Thank you soo much for the information, I was thinking about taking my family of 6 on this in September but wanted to make sure it was worth it for us since we have such a large family. I’ll have to tell the kids to eat until you can’t eat anymore. LOL!!! Thanks!!! I like to interject a little fun into posts when I can :) Well worth the cost and lots of fun. Tell them to stuff their pockets too! You can take the food on the boat or even home with you. 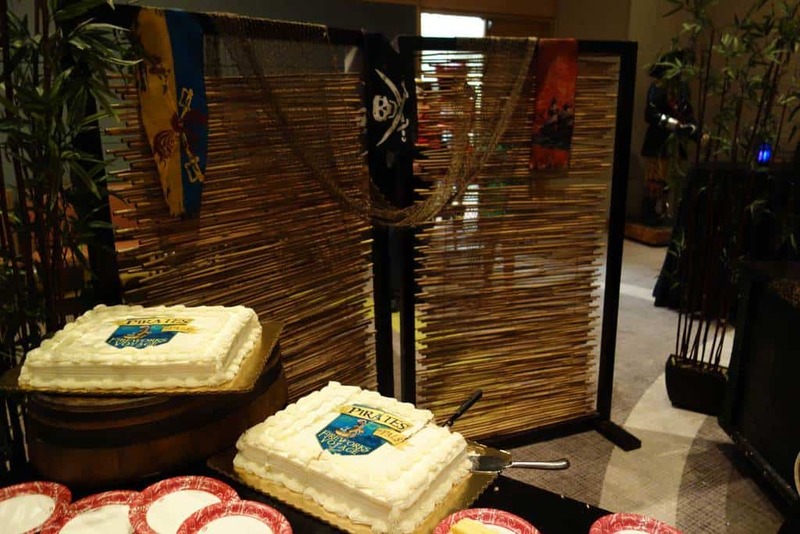 That’s true piratical style! They really took out nights in oct. in the 10 nights we are there it is only 3 nights and no mnsshp nights at all. Unlike last year where they did mnsshp nights. and the phone cms said no P&P cruise for those nights. Oh, though you meant they weren’t doing Mnsshp while you’re there, sorry. :) nope just no cruise on party nights. I really hope they add in dates the 17-27 has 3 dates for p&p (19,21 and 26) and they are sold out. 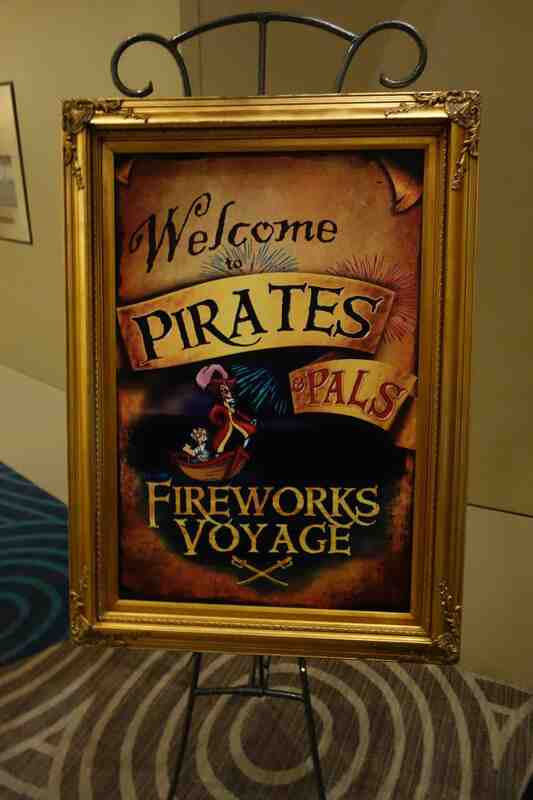 I guess they don’t want the Pirates and Pals groups watching the MNSSHP fireworks? They could easily watch from the Poly Beach though. Thanks. I have another question. Were you staying offsite when you did this voyage? If you were, were you allowed to park at the Contemporary for free for this? What days is this offered? Disney website says its offered on more days during October, do you know that schedule? It’s one of the few schedules that I don’t know because it changes all the time based on seasons. Alicia, I called and booked for October 2013. They gave me dates for the week we are there and then I decided which day I wanted. We are going on Sunday, Oct 13. What did they do for those celebrating a bday? Any extra fun for them ? Great review!!! I just booked this for my son’s 7th birthday. He loves Capt. Hook and was upset that he wasn’t anywhere in the parks last time we went. Can’t wait!! 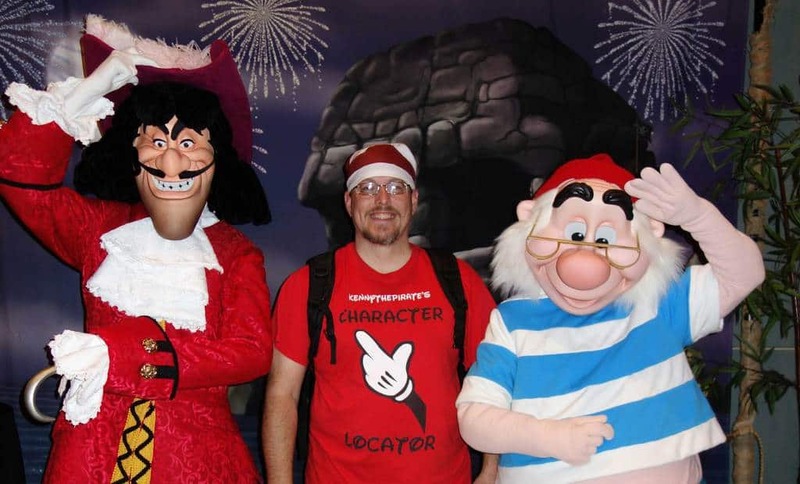 You can also often find Capt Hook and Mr. Smee at Character Palooza. Have fun! I was wondering about 2 year olds. There will be 4 of us and our 2 year old. If there are only so many spots and the 2 year old is free that means they are not being counted as a spot? Do they sit in your lap kind of thing? If the boats are full, they would ask you to place the child in your lap. I take it you never had an odd number then? It looks like your looking through the boat to take your pics-or I could be wrong ? Are there photo pass photographers there? 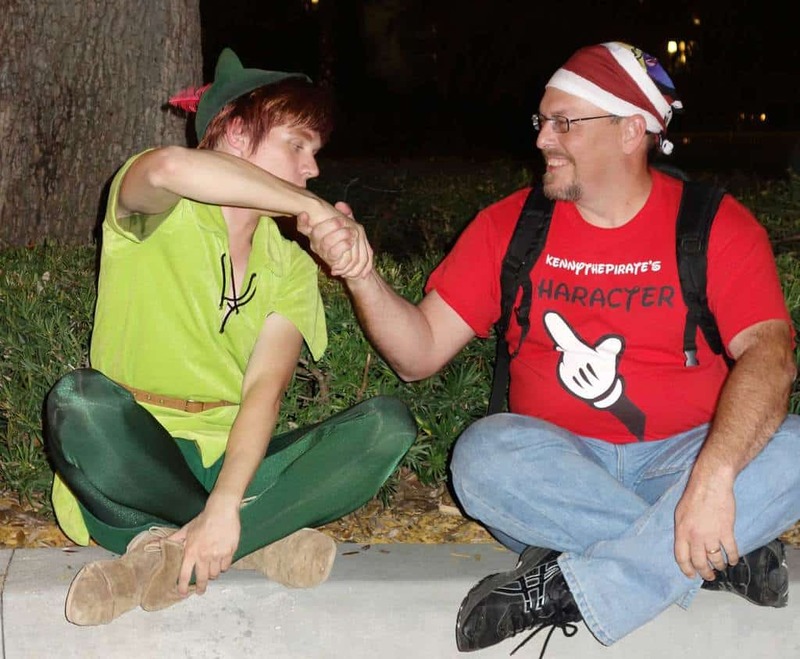 I didn’t realise photopass photographers were at this event, a very happy bunny got it booked for our last night. Got photopass plus already sorted. This looks amazing! Do the characters sign as well as photos? I did not realize this existed. I just tried to call and book for my trip in a couple weeks and they are all booked up. Hopefully someone cancels. Keep trying and hopefully something will open up. It’s a lot of fun. Did this in November with my kids (7 and 4), and we all had a blast. We’ve already planned to do it in September again…this time after we all go to Pirates League for makeovers. You left out the part about the closeup view of the Electrical Water Pageant. Did you not get to do that too? We did when we went. Hey, Kenny! We are wondering about the electric water pageant, too??? 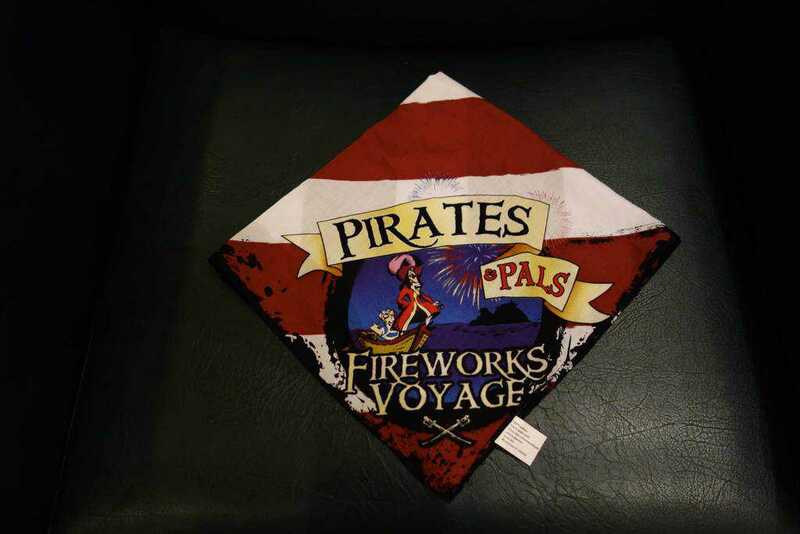 This may be our only chance to see it so a close up from the pirates and pals cruise would be great. Thank you! Perfect timing! Thank you for doing this! We are taking this cruise in 4 weeks with our DD6 and DS4 and weren’t sure what to expect. Now I know to pack their pirate costumes. :) thanks, Kenny! Thanks for the review! We are doing this on Saturday because our daughter is a huge Capt. Hook fan. It looks like so much fun! Great review! 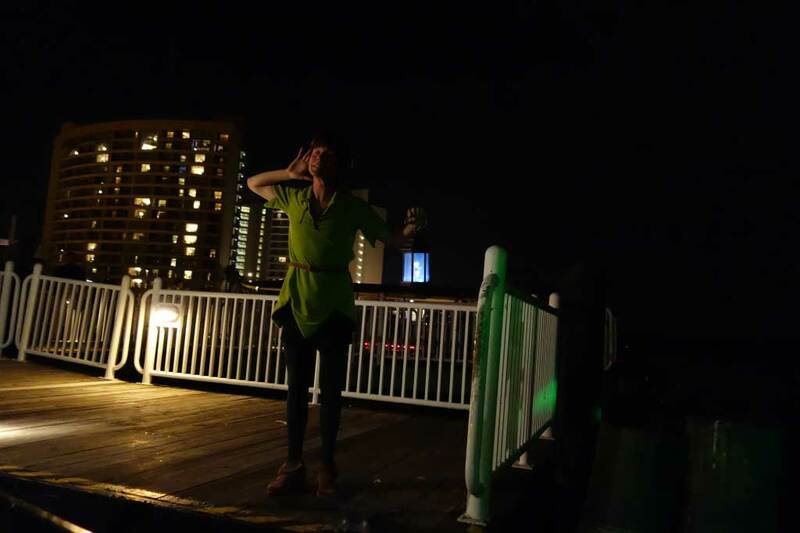 We are thinking about doing this in May, but we have a 2 year daughter and it may be a bit late, but she loves Peter Pan so we’ll see.